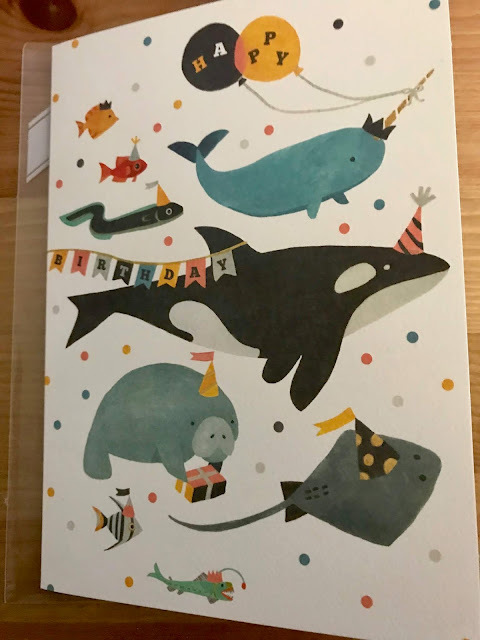 Pictured above is a birthday card I sent to my sister recently. It's from Trader Joe's, of all places! Things are quite hectic at work at the moment, which should last through at least another week, though I've still found some time to write here, because it's a good way to take a break from the very different kind of writing I do for work. 1. // I've made my second donation to the fight against family separation, this time to Kids in Need of Defense ("KIND"), one of the bigger groups people may already be aware of. They coordinate pro bono volunteer attorneys from firms, and match them up with unaccompanied minor clients going through immigration proceedings. (This sort of coordinating and organizing function is important. It's how most of my colleagues and I get our pro bono cases.) I almost worked on a KIND project while in law school, when there was a large wave of unaccompanied minors under the last administration, but they ended up not needing that many law student volunteers. I'd normally prefer to allocate my (extremely modest) donations to groups that focus more on direct services (just a personal preference, no larger reason for that), but the stories of children, including babies, appearing in court without their parents (and sometimes, without lawyers) was just a bridge too far for me to not do something right away, even if it's very little. There was a great r/blogsnark thread about readers' personal experiences with changes in their socio-economic class over time, which yielded a lot of respectful and thoughtful discussion. There was also an interesting discussion about The Cut's interview with Hey Natalie Jean, whom I was glad to see return to blogging. 3. // Lin's recent post about how her style inspiration from nearly a decade ago is still relevant to her today gave me some interesting food for thought. My own hypothetical "ten years ago" board, if I had kept one, would be different from what it looks like now, heavy on the 2008 J.Crew catalog aesthetic. Archana wrote up a great piece about composting. A friend of mine has started a blog based on her interest and experience with the clothing production industry, both as a shopper and as someone whose family is involved in the industry. It's pretty cool! 4. // It's hard to avoid that it's Nordstrom Anniversary Sale time. Keeping in mind that many items are made specially for the sale, i.e. basically the equivalent of "outlet only" items that are likely not the same quality or designs as each brand's regular items, it can still be a good time to get certain specific things, if your expectations are guarded. I really wanted that black dress with the cool neckline in 2016's post, but it was sold out, so my order was cancelled. I never saw that pair of Cole Haan tortoiseshell wedges anywhere else, which strongly suggests it was an "Anniversary Sale only" item, plus the texture of the patent leather was more plastic than on my other Cole Haan patent leather wedges. Even so, I love the look of those shoes (which are an "in the office only" shoe for me that I still wear). I've also tried a Natori Feathers bra from the sale that was noticeably different from a full price Feathers bra I'd previously tried, with less delicate, less pretty lace details. With all that in mind, there are a few things I'd consider buying if they were still in stock once early access ends: The Panache Underwire Sports Bra is great for larger busts, enough that I'm relatively confident that the Anniversary Sale-only version could still be a good choice, particularly because it's in a more fun colorway. Cole Haan has these pointed toe "Tali" flats and shorter block heel pumps with a leather bow that look pretty and business formal-appropriate. I don't really use candles anymore because I don't often get the chance to relax at home (or settle in to study) for long enough to properly burn a candle for several hours to avoid tunneling, but I used to get the Voluspa Maison Blanc candle set each year while I was in law school. They last a long time and have nice, strong scents. Do you shop during the Nordstrom Anniversary Sale, and have you also experienced the items being different from regular, full price items? What do you think of Kavanaugh's financial disclosures?